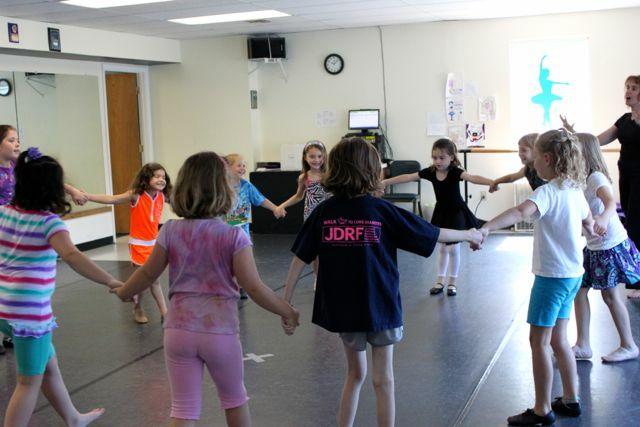 One of my favorite activities to do on the first day of Dance Camp or the first day of class is to create a “Name Dance”. It is a simple and fun activity that helps us learn each other’s names. To begin, start in a circle. One at a time, each student says their name with a simple gesture. Encourage the students to do whatever movement they want – does not have to be a ‘technical step’. Let them experiment with how they say their name – rhythmic, loud, soft, etc. Go around the circle a second time; students may keep their same gesture or change it. This time, when a student does their name gesture, the class must echo them in both movement and sound. The third time around, build the dance. Link a few name gestures together and practice saying / doing them in a row. See if you can make it all the way around the circle to finish the full Name Dance. If everyone is still enjoying the Name Game and you’ve gotten the hang of it, try going faster, in slow motion, facing outside the circle or going in reverse order. This game is a lot of fun and students will remember their step for weeks to come – I’ve had students say “oh, now we’re doing The Emma” or “can we add a Sophia in here”. Some of my classes like to greet each other with the other person’s gesture.